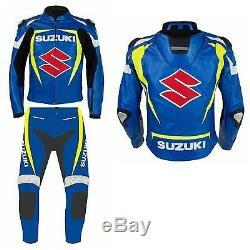 SUZUKI- Racing Motorbike Suit -! 1.3mm Top Grain Cowhide Leather. Original YKK Zipper at Front and Cuffs. Curved Sleeves for proper riding position. All Sizes Available (See Size Chart in Pictures). See size chart which is available in Pictures. Select your size place the order and write your size in note or tell us by message. You can also give your own custom size. You can place your own tags or select your own leather. Discuss us in messages and we will give you quotation with changes. Production time for jacket is 7 to 10 days we manufacture all jackets on order. We reserve the right to refuse any return from objective reason. We are not responsible any Custom Charges. 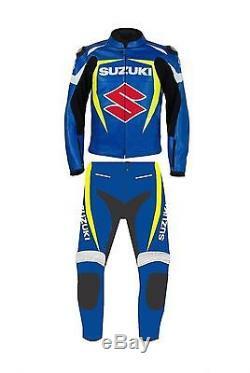 The item "NEW SUZUKI-S-MOTORCYCLE/MOTORBIKE LEATHER SUIT RACING BIKER JACKET/TROUSER(Rep)" is in sale since Friday, July 28, 2017. This item is in the category "Vehicle Parts & Accessories\Clothing, Helmets & Protection\Motorcycle Clothing\Riding Suits".